Yesterday I met my friend Kim from Hobart, fortuitously she was here quilt show weekend. Off we went after some inventive last minute driving round an improvised tourist route! We did some heavy duty shopping in the end. Quilting patterns for her, fabric for a dual challenge, and a new light for me and some books. Lots of lovely quilts to look at, some great fabric, but in the end we were very restrained! 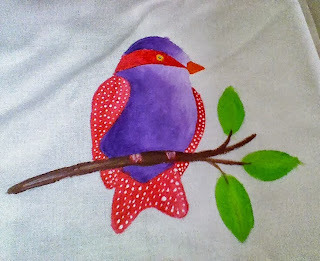 We did do a short fabric painting class with Judy Coates-Perez. Mm I have not really had a huge success and do have a small stash of paints. In the end I was quite impressed with my little bird, I learnt that there is a product called paint extender, not to be confused with seafood extender..... It made the shading so much easier and the paint more manageable! So watch this space, when I have cleaned my room I might have another go at it- even if its to use up my paints. He does have a funny blob on his head, but that will be quilted over. Off again today to do some demo work at the art quilt table, then its the big pack up. And home to work on next years quilts. 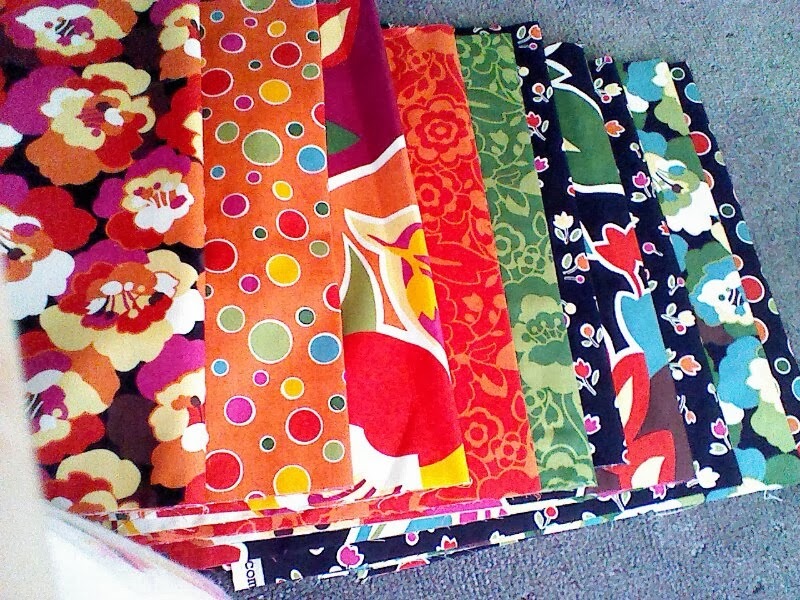 Fabric for new challenge, I have lots of quilt challenges for the next few months to keep me out of trouble and off the streets! shoot I have been doing some demonstrations. we are called 2QAQ as Queensland quilters is affectionately called 2Q, so its QQ art quilters. or 2qaq (2quack) if you say it fast enough! This is great fun, I have so many people amazed that I am doing freeform work, inspired by Rayna Gillman and Gwen Marston. This is very much using solid fabrics with some hand dyed thrown in for some fun. 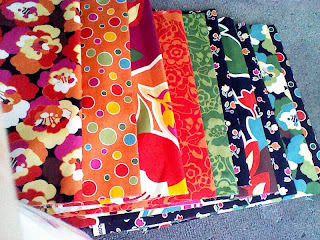 Its cut and sew then cut and sew, if you need more colour or bigger add some, then cut and sew to your hearts content. Some things don't work, but that's half the fun to do something different , they are going to be placemats as our dining table is soft Huon Pine and needs some protection. I have 3 quilts in the show. Am happy that with my silly year of illness that I actually achieved that. No prizes this year, but am happy that my challenge piece with its blue ribbon is there (from March this year). An old log cabin block about to be reworked. There are a little family of these in my cupboard needing to be reworked! A little further along in the process below, needs some more work, but I had to pack up and go home. I will work on this some more tomorrow when it is my turn to demonstrate tomorrow, pleased to be going today to view the quilts, hope I can have a proper look. Another block in the making, this one started as some strata units and was built using narrow strips, just a little fun, its interesting to see how the colours change the look as each new strip is added. One of my entries, I will take some close up shots today of the machine quilting which if I say so myself is pretty good! Just a little too small for the applique category, and couldn't find any more fabric to my liking to make it bigger. oh well if only I was a bit more organised and had got started earlier! My camera died- sadly, so few pictures, but funnily enough I didn't see the need to take hundreds of photos- unlike my travelling partner. I do have some of my own though. Celery to feed all of Villandry! Back into the swing of things I went to a quilters retreat this weekend, 2 nights and 3 days of sewing, chat,- no cooking or housework or hungry family. It was at Staceys at the Gap, luckily I also had a driver, my negotiation of the roads around Brisbane is rudimentary, however I can get to where I need to go- in the end. The whole weekend was great fun, some of the quilters I already had met. They were all working on different projects and I also had several of my own to manage. I finished the star top - too late for the quilt show, and as it is a gift for next year, will not be exhibited except at show and tell. I am working on a top I started in a Jane Sassaman class a few years ago- I did some work on that, but my machine applique skills are basic and I have found it frustrating, should have raw edged it! One of the fun things about retreat is watching others sew, cogitate, and sew a bit more...then unpick!